The document imaging capabilities of the ECOSYS P6130cdn bring exceptional functionality to workgroups of all sizes in a powerful, yet small footprint. 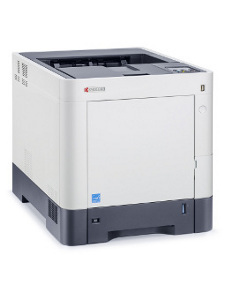 Its 32 ppm output in black or color, and large paper capacity helps users keep jobs moving smoothly. And with optional wireless printing,standard USB host interface and Apple AirPrint capabilities, your workforce is able to stay productive without being tied to the device. As importantly, trusted ECOSYS long life consumables and an impressive drum yield deliver an economical and ecological solution without compromise. TK-5144K Average continuous black toner yield 7,000 pages in accordance with ISO /IEC 19798. Capacity of starter toner: Average continuous black toner yield 3,500 pages in accordance with ISO /IEC 19798. TK-5144C Average continuous cyan toner yield 5,000 pages in accordance with ISO /IEC 19798. Capacity of starter toner: Average continuous cyan toner yield 2,500 pages in accordance with ISO /IEC 19798. TK-5144M Average continuous magenta toner yield 5,000 pages in accordance with ISO /IEC 19798. Capacity of starter toner: Average continuous magenta toner yield 2,500 pages in accordance with ISO /IEC 19798. TK-5144Y Average continuous yellow toner yield 5,000 pages in accordance with ISO /IEC 19798. Capacity of starter toner: Average continuous yellow toner yield 2,500 pages in accordance with ISO /IEC 19798.